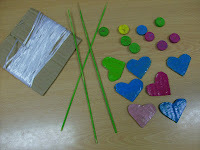 We decided to make a colorful Valentine using cardboard and wine corks as our main materials. Cut up the wine cork and made circles and rectangle shapes. 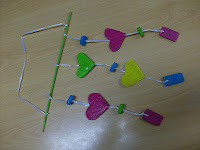 Cut out cardboard and painted the heart shapes bright colors. Strung them up in any combination and offered them to the parents! Very Springy.